This giveaway is now closed! The winner is Zainu. The winner will be contacted shortly and will have to respond with an address within 48 hours, if not another winner will be chosen. Thank you all for participating. We left home rather prepared. It was July after all and the Indian monsoon showers could knock any time now. With a translucent crumbled rain coat and a few neon red bags of potato chips, a custom my sister has accustomed us all to follow while riding a bike with her, we headed to the explore the country side. Half way through our journey it came. An outburst of seemingly heavy rain hushed away as soon as it appeared but left us all dripping. Ek kadak garma garam chai (a strong hot tea) is what we wanted as we shivered on the bike, the wind chilling us to the bones. Luckily, a tea stall is never a few minutes away in India. Some crispy pakoras (deep fried vegetable fritters) tucked in a greasy newspaper in one hand and hot tea in another, we aahed in delight. For years in my mind having a chai cold contradicted the very idea of having chai in first place. This soul warming beverage that I grew up though drank all year round was always served hot. It was not until years ago a tiny and nervous looking waitress got my order for drinks wrong that I accidentally tasted my first iced chai latte. There was vanilla, boldness of cardamom, light pepperiness of star anise and a subtle and soothing chai flavor. This was not a strong chai gone cold that my father would get mad about instead it was mild, milky and frothy blend of good things. So when I saw the Sweet Hazelnut Masala Chai recipe on The Green Kitchen Cookbook, I made it instantly having never tried chai with hazelnut milk. It had all the spices I look for in an iced chai, and though their recipe is for hot beverage, it has easily turned into my favorite cold beverage lately. David and Luise's book is full of beautiful recipes and photos, much like their blog Green Kitchen Stories. Knowing their love for Indian food I was not surprised to find my Indian inspired recipes and good use of spices all through out the book. There are just so many wonderful ideas and inspiration one can get from this book, it would be a shame not to share. The authors were kind enough to send a signed copy for my readers! - Leave a comment on this post mentioning your favorite vegetarian recipe. 1. “Like” Journey Kitchen on Facebook. 2. Follow @journeykitchen on Twitter. 4. Subscribe to Journey Kitchen updates by email, or subscribe to my RSS feed. If you already follow me on twitter and facebook or have subscribed, you can still leave a comment stating the same as it counts as an entry. This giveaway is open worldwide and ends on 15th Sept 2013. The winner will be chosen randomly. Put water and the spices in a saucepan and gently bring to a boil, then reduce the heat and let simmer for 15 minutes. Remove from heat, add the tea and sugar and steep for 5 minutes. Strain out the spices and tea. Add the nut milk and stir well. 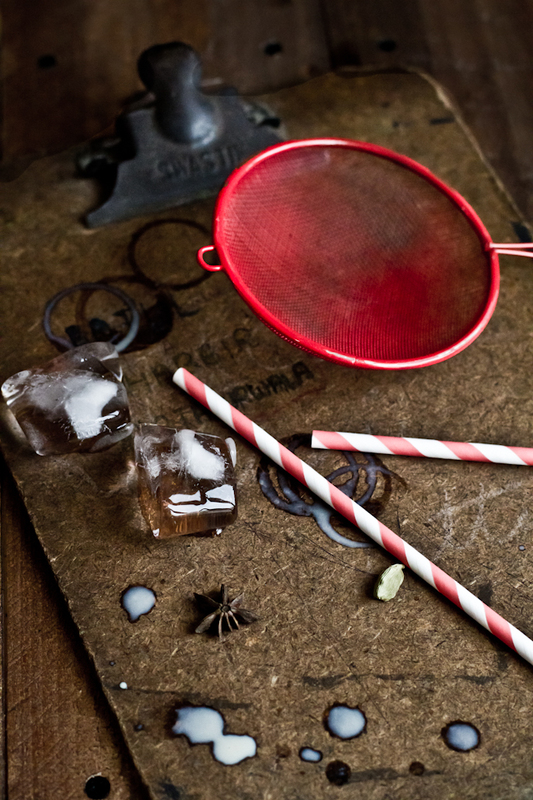 Pour about 1/2 cup of the chai into ice cube trays to make flavored ice. Chilly the remaining tea. 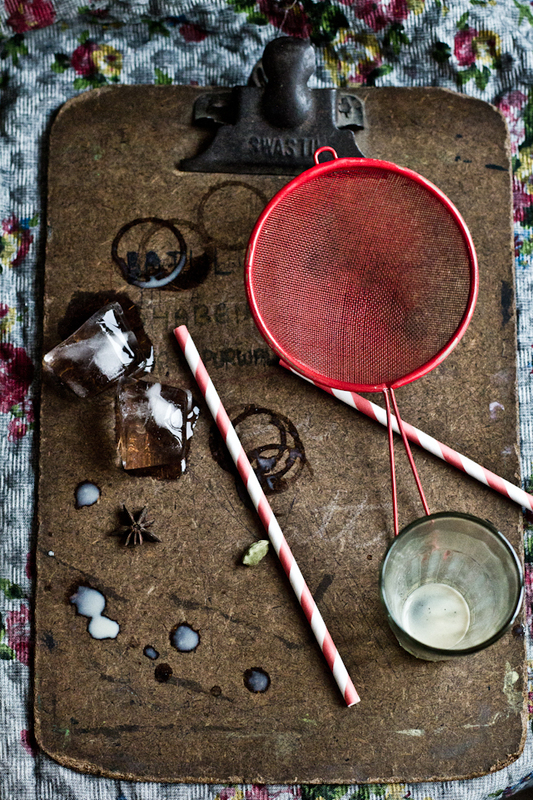 While serving, blend the ice cubes with the remaining chai and serve immediately. Tip: To create froth move the tea back and forth between two glasses or just fill it up in a jar with lid and give it a good shake! I love the look of this! I am definitely going to try it! Kulsum this is a beautiful post. 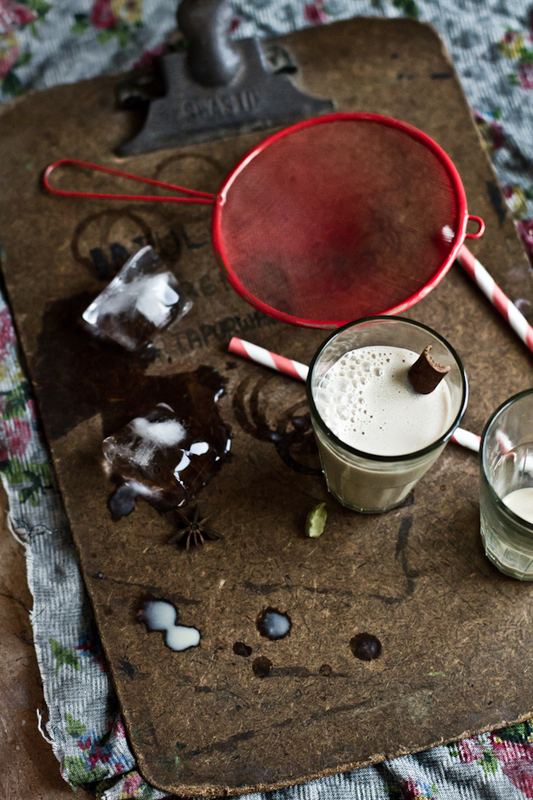 I am fascinated by the idea of hazelnut milk...I will not rest until I make this! A great giveaway and a lovely drink! I've already liked JK on FB. 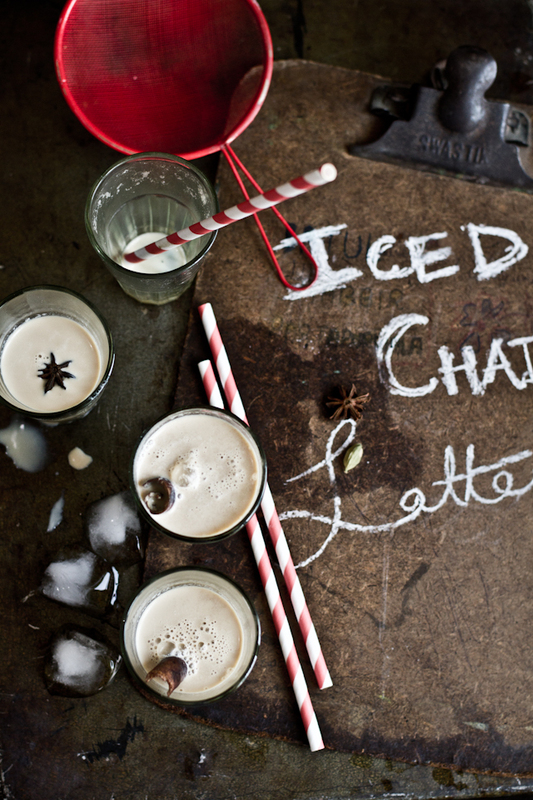 I love chai, especially iced ones! Yum. I too have a thing for Indian food and one of my all-time favourites is Tadka Dahl. I ADORE aloo ghobi - my favorite veg recipe, easily! This sounds amazing. Lately I have been having to skip on my tea on the mornings because of the hot days. I love iced tea, and this version sounds delicious. Lovely photos and great sentiments. I love this drink, wish I had one when we were in school and college. The props remind me of school days. Awesome pictures. I am subscribed already. I enjoy Indian foods tremendously and my favorite recipes would be for pakoras, raita, and mango lassi. Thank you for offering this giveaway to your readers. My favourite vegetarian recipe is a simple vegetable stir fry with soya chunks. I have liked you on fb and followed you on twitter. For the longest time I have subscribed to your blog! Recently My Mum dad went India for vacation, and since than getting intrested in cooking. And eneded up on your blog. I like Paneer Makhnee.. that Punjabi dhaba style. thats a beautiful latte with the masala chai spices. got to try. loved the paper clip board. it so much reminded of the dreaded school exams. Love the use of the exam cork board as a prop!!!! It's so hard to choose just one favorite vegetarian recipe! Chana masala is one of my favorites; I also love shakshuka, saag paneer, and vegetarian Thai coconut milk curries. I liked Journey Kitchen on Facebook. Kulsum, I love the photographs! I think my favorite vegetarian dish would have to be punjabi chole with baturas though anything with eggplant would be perfect too. My favorite vegetarian dish is ratatouille filled with all the goodness from a late summer harvest! 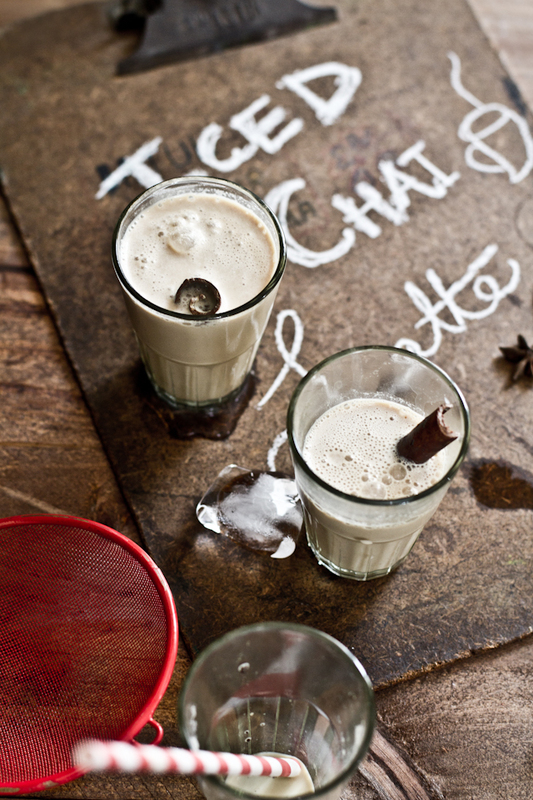 Love your pictures and this chai sounds refreshing. My favorite vegetarian recipe would have to be paneer tikka! What a perfect drink to relax with after a long bike ride, or just on a lazy afternoon. I love that old clipboard you used for a backdrop! Even though I like iced tea once in a while but I m the clingy types when it comes to chai. My fav vegetarian dish has to be anything with paneer. I love a very simple pasta with fresh tomato sauce and a hunk of hot crusty bread...doesn't get any better than that. My favourite meal is my comfort food: dal and rice, with a side of yogurt and a side of sprouted mung beans with shredded carrots and popped mustard seeds and curry leaves! I have already liked JK on FB. 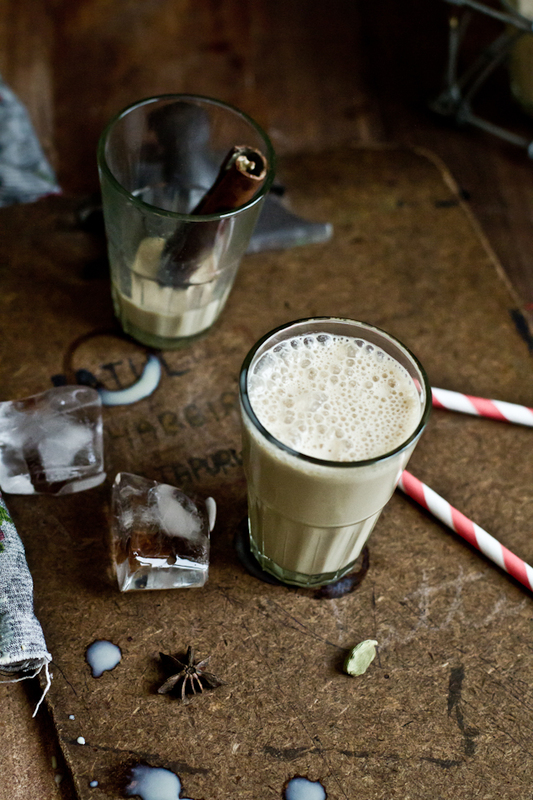 Love the idea of chai latte with hazelnut! My favorite vegetarian food is a nice hot bowl of khichdi with kadhi. :)you space here often gives me much inpiration...thank you for that! My favorite vegetarian recipe is Drunken Noodles with Tofu! My favorite recipe is homemade roti with mock chicken, curry potatoes and eggs. Thanks! Memories of last night's burst cherry galette linger, so at the moment, that's my favorite veg dish. I may change my mind by lunchtime! Thanks for the opportunity. Love your posts and photography.